On Sunday, July 23, 1PM, the Okinawa Association of America (OAA) in Gardena will host an information session about the Okinawa Prefecture International Student Program (also known as the Kempi Scholarship). Every year, the Okinawa Prefectural Government offers scholarships for young Okinawans (ages 18 to 35) to study in Okinawa for one year. This is a wonderful opportunity for young adults of full or partial Okinawan descent to learn about their ancestral heritage as well as develop relationships with local and international Uchinaanchu. 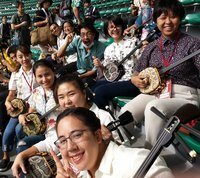 The program offers two options: 1) Study at one of the prefecture’s universities, 2) Study a traditional art (e.g., sanshin, dance, textiles, lacquer, sanshin making). Application requirements include conversational Japanese skills (higher proficiency required for universities) and a relative or family friend who lives in Okinawa to act as a guarantor in case of emergency. Presenters will explain the basics of the program and go through the extensive application and selection process. Past scholarship recipients will be in attendance to share their experiences and answer questions. Applications will be available to pick up at the event and at the OAA office by request. The deadline will be in mid-September, but interested parties are encouraged to pick up the application as soon as possible because it will be a highly extensive process. The OAA is located at 16500 South Western Avenue in Gardena. The event will be in Room 103 of the office building. Please contact us for more information: oaamensore@gmail.com, 310-532-1929.
josephkamiya . Last modified Jul 12 2017 7:30 p.m.